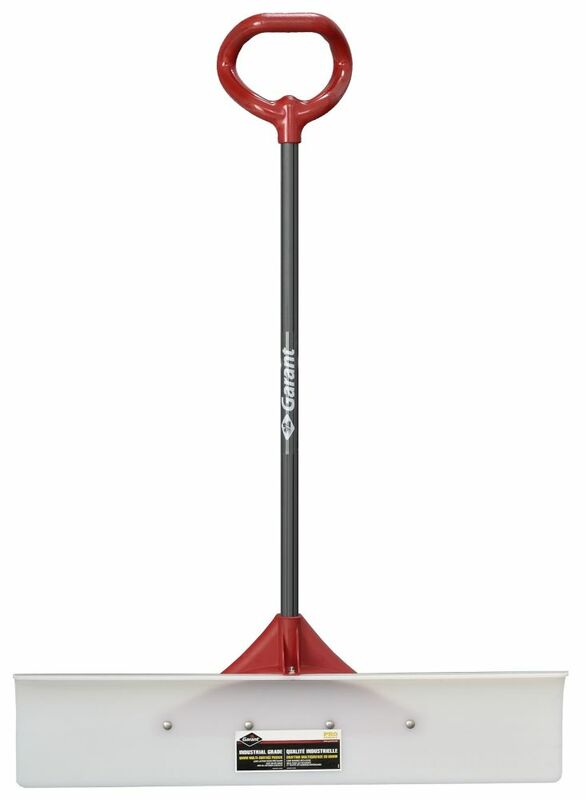 Snow pusher, 36 inch is rated 4.0 out of 5 by 5. Rated 1 out of 5 by Van Hammersly from Had high hopes after paying this much for a shovel The UHMW blade will probably last forever, which is good. The handle is solid wood wrapped in something like an ABS outer sleeve, which is also good. But the red bracing and wedged attachment point between blade and handle is just plastic and not up to the flexing and twisting forces you can expect to throw at this thing when you catch an edge of concrete or packed ice. You pay a premium price for what you think will finally be a durable shovel and instead get something that lasts no longer than the usual cheapo piece of garbage we're all familiar with. The ultra-slick UHMD blade is also fairly heavy and doesn't really allow you to pick up and throw snow over a bank, which gets to be annoying in a hurry. Rated 5 out of 5 by snowguy123 from Worth the money I was hesitant to spend $80 on a shovel, however, I am glad that I did. Primarily I was drawn to this shovel because of its advertised 'commercial grade plastic' after past, average quality and priced shovels degraded very quickly. Also, I liked the fact that his shovel's surface is completely flat, meaning that, as it does wear down where the shovel meets the driveway, it should wear out flat too. Why does this matter? Think about the standard 'snow throwing' shovel and how it has concave grooves on it. While I am not a shovel engineer, I presume that these grooves are to trap snow as you throw it. The problem is, as the bottom of the shovel wears out, when the wear point finally makes it to where the grooves are, you are left spots on the shovel where there are 'arches' (think of the classic mouse hole in a wall), so as you shovel, you are left with trails of snow left by the arches. This shovel also curve up and forward at the top, which creates a snowplow effect that shoots the snow forward as you use it. This is a good time to mention that, with regards to my comments above re snow throwing shovels, this shovel is designed for pushing snow more than scooping up snow to throw it. Also, because it is only about 10" high, once you start trying to push snow that is getting close to that height, the snow being thrown ahead as you push, will surely become taller than the shovel resulting in a second pass being required. I have found that the optimal way to use this shovel is to not let the snow get above 5" (I know, this isn't always possible, for an infinite number of reasons). Another tip: When using it, shovel on an angle, turning it inwards (it is kind of hard to explain by words, so search the internet for 'highway snow ploughs' and you'll see what I mean). Lastly, this shovel is 36" wide, which is 50% bigger than any shovel I have previously owned, so it gets the job done faster. Happy shovelling! Rated 4 out of 5 by TMMay from Depends on the snow This works great when the snow is not slushy heavy snow. If you have slushy snow you might be better off with a regular shovel. Otherwise it works great and takes no time to shovel our deck, driveway and steps. Rated 5 out of 5 by Helen1414 from Great design all around! Bought this shovel and used it for the first time last weekend. Thought it was pricey at first but.....WOW! Great design, best shovel I've ever used. I don't normally write reviews but felt that I should convey my appreciation for a great product. Good job Garant!